Interview: A Warrior Spirit, Aurora. If there’s one moment that perfectly sums up our sunny afternoon spent with Aurora Aksnes back in January (while she’s in New Zealand to play Laneway Festival), it’s when she notices some acorn caps littering the ground of the Symonds Street Cemetery, picks them up, and excitedly proclaims them to be "nut hats!" after a swift investigation. Moments like these are not infrequent, but a non-stop common occurrence when spending any time with Aurora - exclamations that from anyone else would sound ridiculous, but with Aurora there’s a distinct earnestness to everything she does and says, that you can’t help but believe in her entirely. She darts from complaining about mosquito bites, to whimsically posing for photographs (worrying, "How much time do we have left?! "), all the while prancing around scrutinising every leaf she steps on - during which you can literally see every emotion going through her mind. Aurora is perhaps the most human that a person can be, totally unafraid of feeling every emotion that comes into her life. Aurora grew up wise beyond her years in Os, a small town in Norway with a population of just 18,678 people, in a home where wild hedgehogs inhabited the garden outside, surrounded by both ocean and forest - which fostered the beginnings of her magical musical career. At just age six, the inquisitive young girl started constructing melodies, and at age nine she began writing lyrics (in her second language English) about mature topics such as bullying and death. But none of her music saw the light of day until 2012, when she reluctantly gifted her parents a song ('Puppet’) because she hated the idea of performing for them live, but wanted to give them a piece of her music somehow. The song, as well as a performance she did in her 10th grade school assembly of an original nine-minute song about world peace on guitar, were both posted online, which lead to a swift signing by her current management company. The rest, as they say, is history - and thus, Aurora’s musical destiny was born. 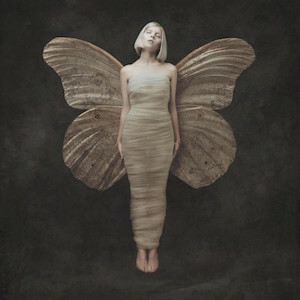 Having a fondness for all creatures and life itself, and finding unique beauty in absolutely everything, Aurora believes firmly that there is no insect not beautiful, owning a pet cockroach named Nightcrawler, and collecting moths as a hobby - even portraying herself on her album cover as a moth wrapped up inside a cocoon. Her other favourite things include cookies (oatmeal ones are her absolute favourite), pancakes, kitty-paws, and music, of course. It’s also a true fact that Aurora is able to recite 200 decimal places of the mathematical constant Pi (in Norwegian), a technique she uses to relax the inner workings of her mind. She’s also the type of person to wear two vibrantly different skirts to a day of press just because she couldn’t decide which of the two to wear, and the type of person to befriend a rogue red balloon falling on her during a soundcheck in Manchester and name him Manchesto (and then be sad when Manchesto is refused safe passage the next day at an airport), and also the type of person who sees magical wishes existing inside of apples - previously explaining that she once gifted an apple to Iggy Pop’s bass-player [Matt Sweeney] at Rock Werchter festival in Belgium last year, telling him that there was a wish inside the apple. Though individually these facts might sound somewhat absurd, they’re all part of what makes Aurora so special - as her ability to see good and wonder in so much of the world and humanity is a truly unique talent, and perhaps even a talent more wondrous and rare than any other. I first spoke to Aurora on the phone back in March of 2016, around the release of her debut album 'All My Demons Greeting Me As A Friend' (the title of which comes from a song which didn’t make it onto the album), and she was just as perceptive then as she is today in the flesh. About her song 'Home', she told us, "It's a strange process, being a human in the modern world," and she also spoke about truly being honest with yourself and your own emotions, saying, "I think it's very healthy to cry. Every time I'm sad, I just think that, 'Okay, so now I'm sad. One day, that will be gone. I won't be sad forever. It's okay to be sad now.' I try to cry it out, and to feel, because the more you touch your wounds, the more you get used to feeling, it becomes less scary. And it must be horrible to be scared by something so natural like sadness, it's important to embrace all sides of life." This acknowledgement of the necessity to be in touch with your own emotions, and to accept them, even when it’s a feeling of sadness, is a lesson that many people will go their whole lives without learning - however in Aurora’s mind, it’s obvious, and all just a part of being human. 'Through The Eyes Of A Child' is the most important song on her record for Aurora, a song during which she sings, "Scars we cover up with paint," a telling observation on how humanity tends to hide away from feeling hurt. Her embracing of emotions is what makes her both vulnerable, but strong at the same time, for living without a fear of feeling is a truly remarkable way of life, and one we could all learn from. As well as the undeniable emotion involved in her songs, you can’t listen to any of Aurora’s songs without hearing her hometown injected into them in one way or another - in the lyrics, the instrumentation, and even the samples - with 'Running With The Wolves' featuring field-recordings, and even one of Aurora hugging a tree (a soundless sample, but nonetheless, it’s still there). On 'Conqueror', Aurora’s self-awareness comes to an apex - with the realisation that true empowerment cannot come from others, but only from within yourself. This self-realisation makes its way into 'Warrior' too, a song made with her fans in mind, who she refers to fondly as 'Warriors and Weirdos' - not wanting to name them as though they belong to her, admitting that her relationship with fans is very much a two-way relationship, and that they need each other. 'Warrior' is an ode to strength, and finding strength, during which she implores, "Let love conquer your mind," a call to arms of advice, and advice that she herself has heeded - for love is no doubt at the forefront of everything that Aurora does. One year later, when we meet for the first time in real-life inside a humid, buzzing press-room at Laneway Festival in Auckland, Aurora exudes nothing but pure joy when handed a necklace made of candy, "This is everything a girl needs; that’s amazing. I can’t wait to eat it!" Talk to Aurora for any extended period of time and you’ll notice her intense eye-contact - it’s unwavering, but not at all unnerving. In fact, her eye-contact can’t help but wash a sense of calm over you, as it feels like a look directly into her soul, and a genuine human connection being formed. New Zealand is 17,638 kilometres away from Aurora’s hometown in Norway - an enormous distance for any artist to travel, and long-distance travel has become an ongoing part of Aurora’s life since her album’s release. Just look at her tour dates from the past year and you’ll be in awe of the sheer distances she’s travelled - a fact which fills her with both joy and sadness. Homesickness is unavoidable, especially for Aurora, who is the only one of three siblings to still actually live at home, and she says often just speaking to her family will make the homesickness worse, because she can hear that they miss her in their voices. Her two elder sisters, Viktoria and Miranda Aksnes, are both creatives in their own right, with Viktoria designing clothes and accessories for her brand 'Fårikål’, and Miranda working as a make-up artist. They both often work with Aurora on music videos, photoshoots, television performances, and as part of the ‘Aurora’ world as a whole - and Aurora wouldn’t have it any other way, as she feels most comfortable with her sisters by her side. She’s immensely aware of the image that she presents to the world, and wants it to be true to herself at all costs. She explains, "I like to be remembered for really 'Aurora', which is a package of how I am, and what I do, and also how I look like, which is a wonderful way for people everywhere to express themselves." Aurora’s perception of her image and her surroundings can clearly be heard in her music - she has an innate and fundamental understanding of the world around her, be it both the good and bad sides. When we talk about the issues Aurora is passionate about it’s clear that she’s thoughtful in her answers, and the fact that she so readily accesses a range of emotions perhaps gives her a unique insight into these issues. There’s a lot of things in the world that Aurora is troubled by - she comments, "It’s so weird," at numerous points during our discussion of the flaws of society, clearly unable to comprehend some of the injustices that go on on Earth, even noting an embarrassment to be a part of humankind at times. She has an insight like no-one I’ve ever met before, having strong and liberal views about the expression of sensuality and consent, as well as how humanity treats one another, and learning to love oneself. During our photoshoot, she’s eager to please, asking for our opinions on each of her self-styled outfit choices, and ideas on items to accessorise with. The satchel she brings along with her is filled to the brim with the most Aurora-esque pieces imaginable - it’s a treasure trove not dissimilar to Hermione Granger’s beaded handbag from the Harry Potter books filled with seemingly endless items. Alongside her distinctive style which she describes as "an Aurora mash-up," Aurora shows us a Pounamu necklace that was gifted to her by a fan earlier in the day at a meet and greet, and is unabashed about changing outfits in the cemetery - "We have the trees!" she exclaims. As well as examining her present-day life, we also touch on the future - discussing her future music, and what’s to come in her musical career. At just 20-years-old, she’s already achieved a lot - receiving praise online from the likes of Katy Perry, Shawn Mendes, and Troye Sivan, performing on American television, releasing her debut album, and travelling the world on tour - and she doesn’t show any signs of slowing down anytime soon. Aurora says she’s always working on new music, and describes her writing process on tour with the most Aurora-esque simile, "I have to really make as many melodies as I can when I’m home, so I’m like an animal saving up for Winter," - but her melody-making hibernation may be nigh soon, as her current album cycle is nearing its end. With only a series of festival performances in Europe slated for 2017, this year will give Aurora time to finally craft her new melodies into songs that will likely make up her much-anticipated second record. Later, after her Laneway performance, we spot Aurora backstage just after sunset at Albert Park around dinner-time, fluttering about barefoot and enthusiastically running over to a bird-cage, which appears to be sitting there for no other reason than for her enjoyment. I half expect an apple to appear out of mid-air to complete the picturesque tableau, but alas, it does not. "Why can’t there be a wish inside an apple?" questioned Aurora of the world once. So, next time you take a bite out of an apple, make sure you think of Aurora, and release the magical wish within. CDM: Thank you so much for taking the time to hang out with us today - we’re so excited you’ve finally made it to New Zealand! When we spoke last year you were hoping to visit some 'Lord Of The Rings' scenery, so we’re so sad you’re only here so briefly! AURORA: So am I. I know, but it means I’ll be back. So it’s kind of a good thing as well. CDM: I wanted to talk about firstly, the inspirational Facebook status you posted about body positivity on January 1st - the highlight in my opinion being, “Take pride in being strong. In being curvy. In being skinny. Walk with your heads high and you'll see there is nothing more beautiful than a confident woman. Let's remind ourselves everyday how strong these bodies are. How these amazing bodies are designed to carry life, not to look like jewellery.” It seems like such an obvious thing, but in reality it’s so hard for women to feel this way about our own bodies because society has conditioned us to feel like we need to look a certain way, and dress a certain way, and groom a certain way. What can we do to combat this? How does one learn self-love? AURORA: I know. I think sadly enough, we need-- for some people, it might be enough to tell it to yourself in the mirror every morning, and to find confidence in saying, ‘I don’t call what the world tells me. I shouldn’t care. Why should I care?’ And have the strength in your mind. I think most of us can do this, up to a certain extent. But then we need the confirmation from the people around us, and I think then the only thing to do is to find people that find beauty in you. Because everyone has beauty in them! If it’s great humour, or a brilliant nose, or beautiful hands, or a beautiful mind, kindness, creativity, and all those things. I think for me, I feel so much more worth, when I surround myself with people that see 'me'. And if you feel small everyday, then you should definitely look around you and say, "Maybe I should hang out with different people that don’t walk in front of me when we’re all going out for a snack." To find people that appreciate you in the way that you deserve to be appreciated. CDM: I guess it’s a tricky balance, because you obviously want that confirmation from others, but if you rely on that too much it can also be a negative thing. AURORA: Oh, absolutely. But I think if you find good people, they will also help you to see that you are amazing. You know? It’s just the greatest thing. I do that. I just changed the people I surrounded myself with, and it changes a lot. People at work, people at school, people at home, your friends - you have the right people in your life if they make you feel like you’re worth a lot, if you’re important. CDM: Do you find it important to use your platform to speak strongly about issues you’re passionate about? AURORA: Yes, I think so. CDM: What other issues are you passionate about? AURORA: It’s hard to choose because you see these flaws in the system every day. It’s so weird, it surprises me so much, day by day, again and again, how weird we can be, and how mean we can be to other people, to creatures without a voice, without the possibility to say no, to animals, and how millions of people can believe something that justifies injustice. It’s ridiculous, and it’s so strange. I just feel like if I see something and I would like to talk about it… That photo I posted, I love skin, I love shoulders, I love sensuality if it’s worthy - if you’re strong as well, if you’re not giving your body to the world, but owning it. There are very different ways of being sensual, and I think it’s scary if we are supposed to be scared of sensuality and say that it’s not innocent, and not beautiful. CDM: The whole idea of consent, and innocence is bizarre. CDM: You’d think that girls would be supportive of other girls. AURORA: But we’re not. And it’s very disappointing. You see blindness in people everyday. Especially on the Internet. It’s such a horrible thing. CDM: Especially for female popstars on the Internet, as the online space can also be a place where hatred can be fuelled. AURORA: But it’s weird that the world is like that, and that people are like that. CDM: I guess people think the Internet gives you an anonymity. AURORA: I don’t understand why we don’t see further… What happened in the evolution of humans that made us think that these things are okay? It’s so strange. We are so eager to make other people feel stupid and less smart - "Didn’t you know?!" - and we love shaming other people. And good normal people love shaming people. It’s so weird, I don’t understand it. It makes me embarrassed to be a part of humanity. But then there are a lot of good things - but it’s so strange. I really can’t understand. It makes me so sad. CDM: As an artist who plays a lot of music festivals [obviously you’re on the Laneway circuit at the moment], I wondered what your thoughts were on ‘Bro-Chella’ and festivals that heavily book male artists, where there are so many female artists that tend to get ignored. Do you think this is a reflection of the music industry? Or just of the whole world? AURORA: That’s very interesting. Are there more male artists in the world? AURORA: Maybe the females that are doing it really well are not doing festivals anymore. Aren’t festivals about giving people the chance to hear new artists as well? Hmmm. It’s hard to mean something when I don’t know if there’s actually more male bands… But I wouldn’t think so. But I wouldn’t want the world, or a festival to choose me just because I’m a woman, because I want it to be about the music. But if it’s not about the music… It depends who’s in charge. CDM: I saw you recently tweeted a fan who wasn’t able to attend one of your side-shows in Sydney due to it being R18, and you said you also hated age-restricted shows. Is playing All Ages shows wherever possible important to you? Especially as so many of your fans are under 18! AURORA: Oh yes. It breaks my heart to see that I’m actually in Sydney, or Auckland, one time - maybe the only time this year - and a person, a fan, a supporter, won’t be able to meet me, or see me, just because of their age. It’s weird, music shouldn’t really have an age limit, unless it’s very provocative, or heavy. But my music shouldn’t really have an age limit! And it doesn’t, because people of all ages come to my shows. It’s weird that music, a musical experience, has to have something to do with alcohol. I do understand it, because for some reason we need help to let go, to dance. CDM: Which is also a strange concept anyway. AURORA: I don’t! But it’s how we’ve become. We’re not that free anymore. We are more locked, we have rules, we have norms, and ways to behave, unless you want to be stared at. It’s so weird, I don’t understand it. I do understand, and of course I enjoy a glass of wine, but it’s a shame - I don’t like it at all, that music, that my shows have an age limit. CDM: And so often, you don’t get that final decision, especially if it’s a festival. And for promoters, it’s a lot more expensive to make a venue all ages for a night. AURORA: But when I can afford it, I’m going to do it. Definitely. CDM: I know there were quite a few New Zealanders who were super sad they couldn’t see you at Laneway because they aren’t old enough to attend. Do you wanna come back and play your own shows here? AURORA: Definitely. As soon as possible, actually. It depends when I release my next album. Which I hope is not too long! CDM: Have you been songwriting while on the road? AURORA: Oh yeah. For over a year. CDM: It’s been such a long time since your album came out! CDM: Do you write songs on the road? How does it compare to writing at home? AURORA: I don’t like it compared to being at home, because I get really easily distracted by sounds. Like now, it’s hard to focus when there’s sounds around you, but you get used to it as well. But I just write in a different way, when I’m on tour, surrounded by the world - and not in my own world, which I prefer to be, in Aurora’s world. <laughs> But I have to write all the time. It makes me feel better than to not write. CDM: I know a lot of artists get quite bad writer’s block on the road, but I guess you have to force yourself to keep going. CDM: Before you go into your hibernation on tour! You’re not the only creative one in your family, with both of your sisters Viktoria and Miranda having their own creative endeavours as well, which also tie into your own musical journey. What’s it like working with them in regards to your style? AURORA: It’s amazing. Especially because I know what I like, and what I want, and it’s hard for me when other people try to change that - as people try to do all the time, unconsciously, because people have different tastes in what is magical and what is not. But it’s nice to work with my sisters because they respect me and they know what I want. And they also have strong opinions, and they can challenge me. CDM: Do you ever argue about things with them? AURORA: We don’t argue. I like that I’m comfortable to say 'no' with them. CDM: It’s easier to say no to your siblings. AURORA: Yes! And it’s great because they’re with me at the things I’m most uncomfortable with - like TV shows, photoshoots, music videos, that’s when they work with me. CDM: Do you find fashion/style a way to reflect what you already express through your music? AURORA: I just don’t know much about fashion - I guess it’s just a word. I’ve always liked-- it makes me relax a bit more when I feel like people can have an idea of my mind - a memory of my mind and my soul, by the way I look. Because I like to be remembered for really ‘Aurora’, which is a package of how I am, and what I do, and also how I look like, which is a wonderful way for people everywhere to express themselves. CDM: Do your sisters always get to come on tour with you? AURORA: I wish! They come sometimes. If I go on tour and am doing a music video in The States, then they come for the last day in The States. I miss them so much now! They’ve come with me a few times, sometimes I’m like, "Oh I want Miranda to come with me to my show in Paris," for example, and then she comes with me to my show. It’s not that expensive to travel around in Europe because everything is so close - but I’ve only had them with me to The States two times, for The Jimmy Fallon show, and for my latest collaboration with YouTube, the ‘Winter Bird’ video. CDM: Do you get homesick on tour? I remember when I first interviewed you, you described your hometown to me, and it sounded so beautiful - it must be hard being away from it for long periods of time. How do you deal with it? AURORA: I don’t know. I love to cry. I love to feel things. I cry sometimes, maybe after a phone call, or if I hear their voices, or if I can hear that my Mum misses me too. Because I’m the youngest, both of my older sisters have moved away, and I still live at home because I’m not really home and it wouldn’t be worth it to buy an apartment now. So it hurts my heart when I can hear that they miss me too, I can hear it in their voices, when they’re like, "Oh, but we’re glad you’re having fun." I’m very bad at phoning them, because I know I’ll miss them more if I call them. Most of the time I’m busy and I just have fun and I think about other things, but I miss my house a lot, and my view. CDM: When you’re on tour, are there certain things that you’ll always do in different cities? AURORA: It’s not really a routine, because I feel different everyday. Today I was very ready for the world, the only thing I needed to do was eat breakfast, and listen to some music, and dance a bit in my room. CDM: Do you try to explore the different cities you go to? AURORA: When I can. Sometimes I go running to get a bit of a look at how the city is. But now I have pains in my muscles from my running-trip yesterday. CDM: Where did you go running? AURORA: Around in Melbourne. In the city, it was really nice. It’s different everyday. I like to read. I like to meditate and do some yoga to try to create the same calmness I have in my living room at home. CDM: Do you have any favourite cities? AURORA: I like all of them, they’re all nice - and different in a thousand ways. But of course, I really like it down here. I haven’t seen much of Auckland, but I know I love New Zealand. After the show I have some time, so I think we’re going to walk around, and find a nice restaurant. CDM: You’ve received a lot of love on the Internet, from the likes of Shawn Mendes, Katy Perry, to Troye Sivan. I loved your reply to Shawn Mendes about his good nose - what do you like about his nose? AURORA: It’s sweet! I don’t know much about him. So I thought I should say something to him, because I don’t know about his music. CDM: He’s really good live, if you ever get the chance to see him. AURORA: Oh, he’s good? That’s wonderful! That’s nice. CDM: Are there any up-and-coming artists you’d love to shine a spotlight on? AURORA: Strange Hellos. The bass-player in my band, Fredrik [Vogsborg], and also my old bass-player O. Martin, they have a new band called Strange Hellos, and they have a song called ‘Broken Teenage Hearts’. It’s kind of like dream-indie-pop. 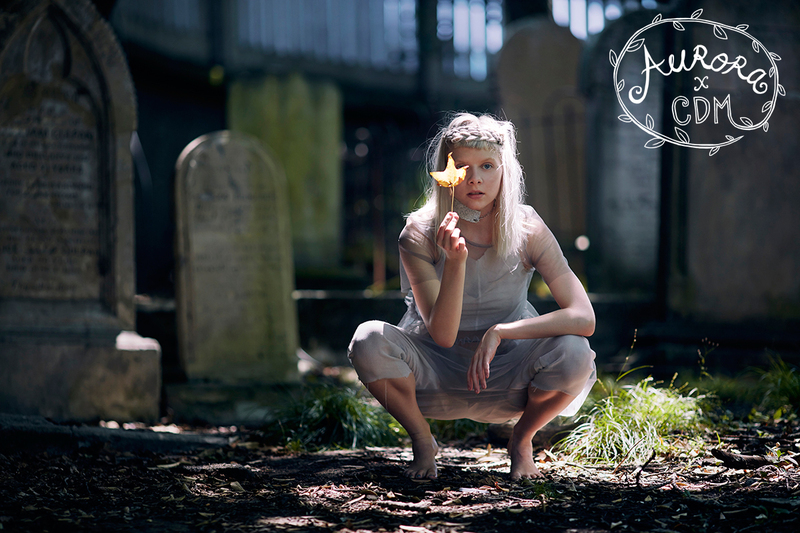 Aurora's album 'All My Demons Greeting Me As A Friend' is out now - click here to purchase. Meet / GreetMeet/Greet Interview: Laneway Festival’s Travis Banko. MusicAurora releases new song 'Animal'. MusicWatch: Aurora perform 'Conqueror' on The Tonight Show. MusicInterview: Chvrches’ Iain Cook vs. Martin Doherty vs. Lauren Mayberry.